Your days of free tethering with a Verizon phone may have come to an end this weekend (at least on certain devices). 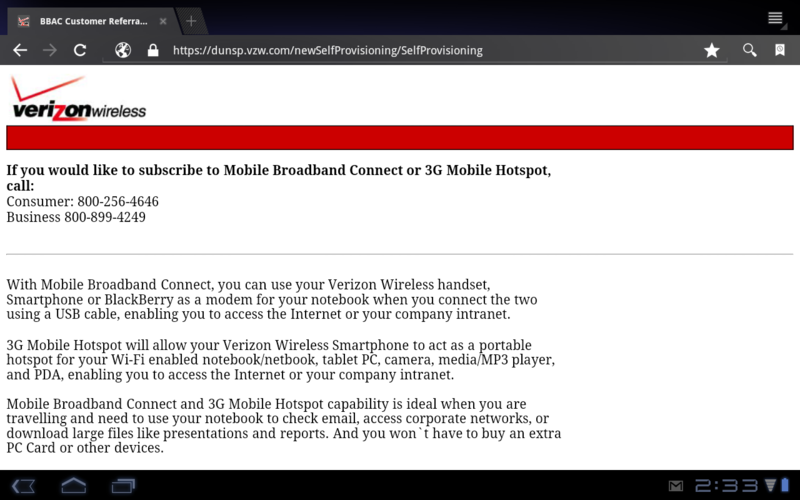 Our inbox filled up with reports of users who received a warning message (pictured above) in place of the website they were trying to reach while tethering. We’re not surprised by this at all, especially after seeing Wireless Tether get the stiff arm from Big Red at the end of April, but that doesn’t mean we have to be happy about it. If you want to use Wireless Tether going forward on a DROIDX or Thunderbolt with Gingerbread, you’ll have to fork out $20 a month for a 2GB plan. And I’d go into arguments on why I think this move is garbage, but we all get it, don’t we? Most of us feel like we should be able to use our “unlimited” data any way we see fit and Verizon isn’t about to let us have that much control. They will argue that using our devices to load up data-intensive web pages or streams would harm their network if done by a massive amount of people, but we all don’t care and want to do it anyway. It’s an argument we can’t and never will win unfortunately. Anyone tried any of the other tethering apps lately? *Note – From what I can tell, this is only affecting Gingerbread builds that attempt to run Wireless Tether and not other tethering apps. My Thunderbolt and DROIDX both popped up the message above and are running 2.3. I also used the non-Market Wireless Tether. *Note 2 – Barnacle appears to work still. Cheers Mike, T and everyone else! Handful of New Motorola Devices Spied in Site Redesign, XOOM 2 Included?